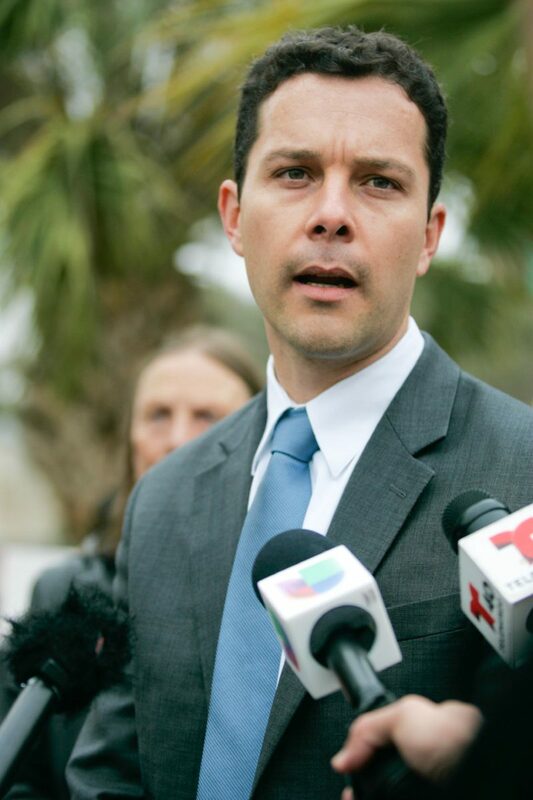 Efren Olivares, an Immigration Attorney in Alamo, speaks in front of the federal courthouse in February 2015 in Brownsville. María Andrés de la Cruz was apprehended by Border Patrol agents in late May, shortly after she crossed the Rio Grande. She didn’t know where exactly she was or even what day it was. All she knew was that her three children were with her and they were on U.S. soil, having fled Guatemala to escape threats and violence. Border Patrol agents took de la Cruz and her three children, who range in age from 7 to 11-years-old, to an unnamed detention center, where she was then separated from them. Nearly two weeks since their apprehension, she still has not seen or heard from them and has no idea where they are. Stories like hers are not unique, said Efrén Olivares, racial and economic justice director of the Alamo-based Texas Civil Rights Project, one of the four legal advocacy groups that filed the complaint on behalf of five Central American families arguing that the U.S. government’s “zero tolerance” policy of separating migrant parents and children who enter the country illegally violates international law. The other attorneys include McAllen-based Garcia & Garcia law firm, the University of Texas School of Law’s immigration clinic and the Washington-based Women’s Refugee Commission. The situation is “serious and urgent” and carries a “risk of irreparable harm” for those separated, they argue in the request, which asks the human rights commission to order the U.S. government to immediately reunite these five families and end the “systematic practice” of separating migrant families at the border. “Any amount of deliberate, unjustified separation between children and parents by a State — especially when employed as a punitive tactic — is a violation of their human rights,” the complaint reads. The Washington-based commission is part of the Organization of American States, which includes all 35 states of the Americas except Cuba. OAS has acknowledged receipt of the emergency request, Olivarez said Friday, and he expects the group to issue an order in a few weeks. In the meantime, the legal groups may ask the OAS to allow them to add additional families to the complaint. Family separations increased in April when U.S. Attorney General Jeff Sessions announced his office was imposing a “zero tolerance” policy on migrants who enter the country illegally. In practice, this means that parents are held in Homeland Security detention centers while they await prosecution for illegal entry in the federal court system while their children are taken to detention centers or shelters run by the Department of Health and Human Services Office of Refugee Resettlement. “This is (now) happening on a massive scale and systematically. They’re not making individual determinations,” said Olivares, who estimates that McAllen “very likely” has the highest number of family separations in the country, with hundreds of separations having occurred over the past two months. The attorney said 12 individuals who appeared in McAllen’s federal court Friday morning told a judge they had been separated from their children after they crossed the border. Additionally, the legal groups want the U.S. government to provide the commission with the latest information available as to just how many families have been separated at the border since the “zero tolerance” policy took effect.